I don’t know what exactly is going on with the weather this year folks. Well really, 3/4’s of last year and continuing into this year. This constant precipitation is for the birds. Now that monsoon season has stopped in central VA- we seemed to have gone from Winter into a deep arctic freeze. I just can’t keep up. The irony being that I hate being hot, and typically embrace Winter with both arms open. This is just ridiculous though. Snow I can handle. This constant cold rain, not so much. Ugh. It’s also meant we’ve been fighting off a lingering, constant case of the sniffles + cough combo. The world’s most annoying cold that isn’t debilitating, but still a major inconvenience. One we just can’t quite kick. It probably doesn’t help my mood any either that I was finally over the hump with it myself after 10 days… and then my child sneezed directly into my face leaning over to give me a hug and kiss goodnight. Spewing sick germs all over me. Guess who woke up sniffling, snuffling, and hacking again the next morning? This lucky, loved Mama right here. I could even be mad. It was one of those freak accidents, and my little man felt just awful about it. Don’t think I didn’t milk it though for extra cuddles, reading books together in bed, and several undisturbed naps. Naturally, I fell back on my two infamous stand bys- lots & lots of hand washing, and cooking feel better soon foods for the rest of my infected family. It can be hard too to find and prepare something that fits the bill when your loved ones are sick. Nobody was sick enough for the BRAT diet, and we were all soup-ed out. What else could I make though that would be comforting, and also cut through the crud to actually hit their taste buds? 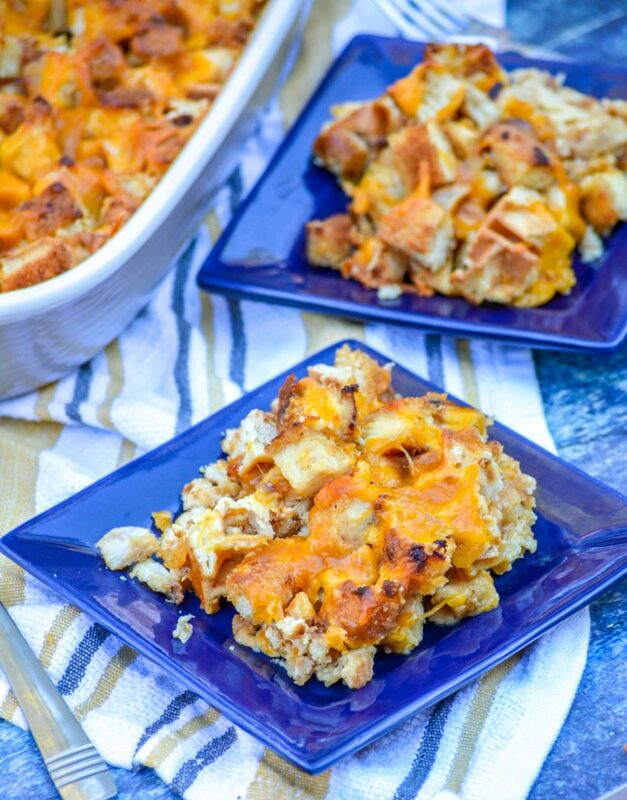 Hello Chicken & Waffles Casserole- it was just the thing we needed! So here we’ve got some options, but the recipe starts with fried chicken. You can most certainly use homemade fried, boneless chicken. For convenience sake though, I usually opt for frozen. I just cook them according to the package directions, and go from there. I either use crispy chicken strips, cutting them into one inch chunks, or popcorn chicken and cut those in half. For the waffles, you can either use store bought frozen Belgian waffles, or make your own. I make large batches of them on the stove top and freeze them for breakfasts. I find they’re a bit sturdier. 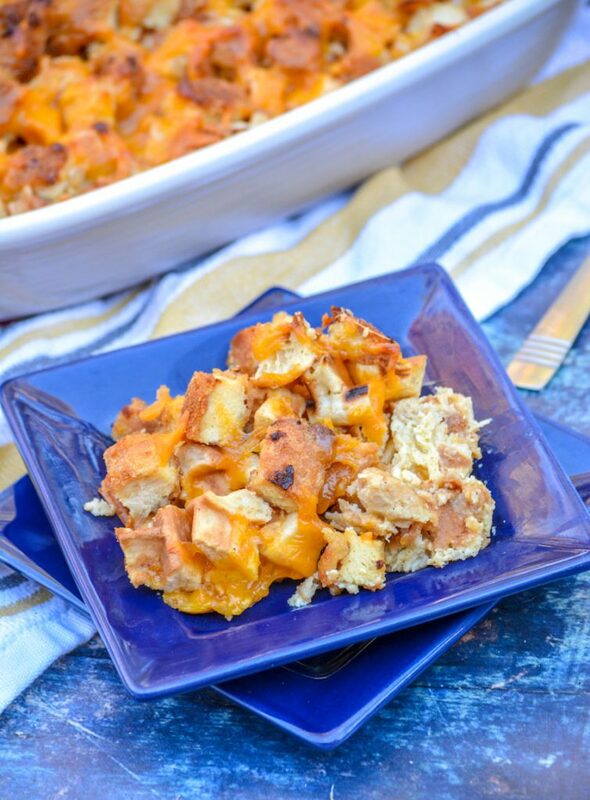 Halve your prepared chicken & waffle chunks and the shredded cheddar. 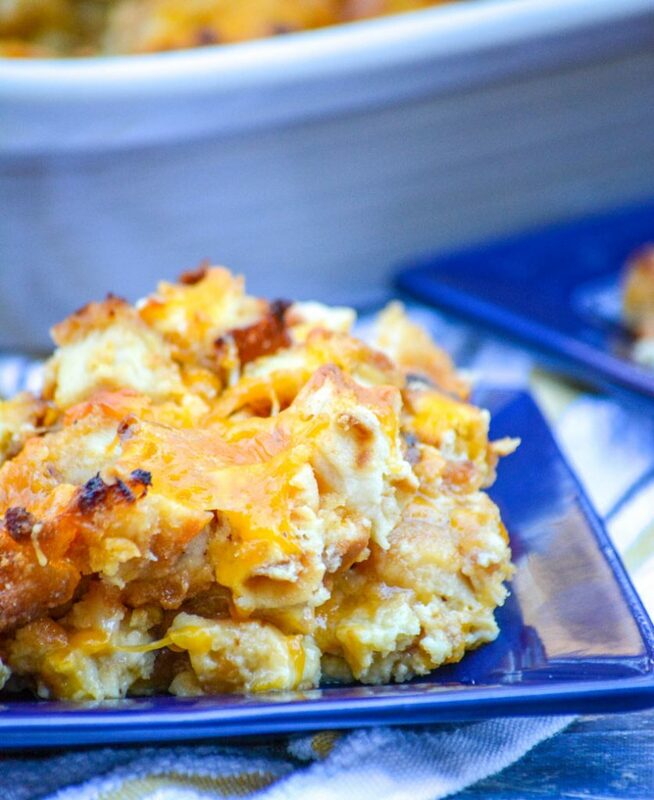 Layer them, repeating twice in a greased casserole dish. Whisk together the eggs, half & half, syrup, and salt & pepper until the mixture’s smooth. Slowly pour that out over the chicken and waffle chunks. 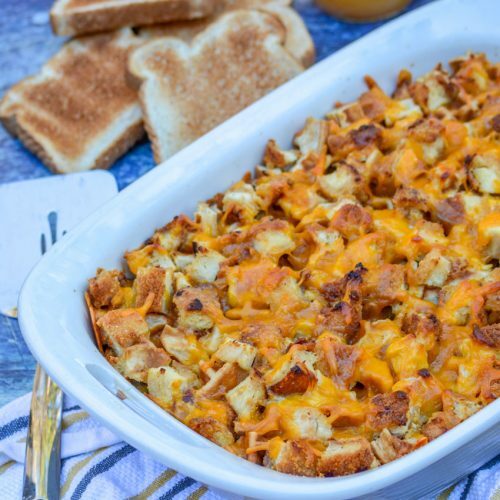 Cover the casserole tightly with cling wrap, and refrigerate for an hour. Remove the wrap, and bake at 325 for 45 minutes, or until the eggs are set. Let the dish rest for 5 minutes before slicing and serving. Serve with an optional drizzle of maple syrup. Optional, but highly recommended! 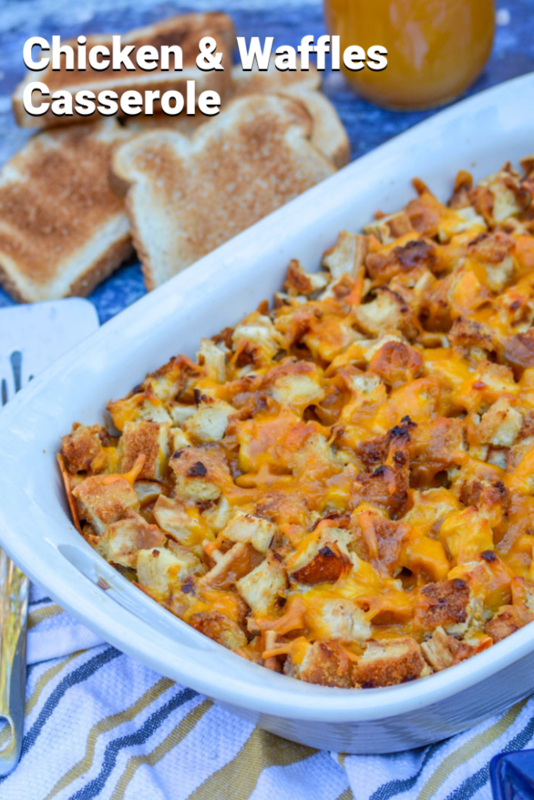 This quick and easy casserole is the perfect way to get your chicken & waffles fix, without any extra special effort. 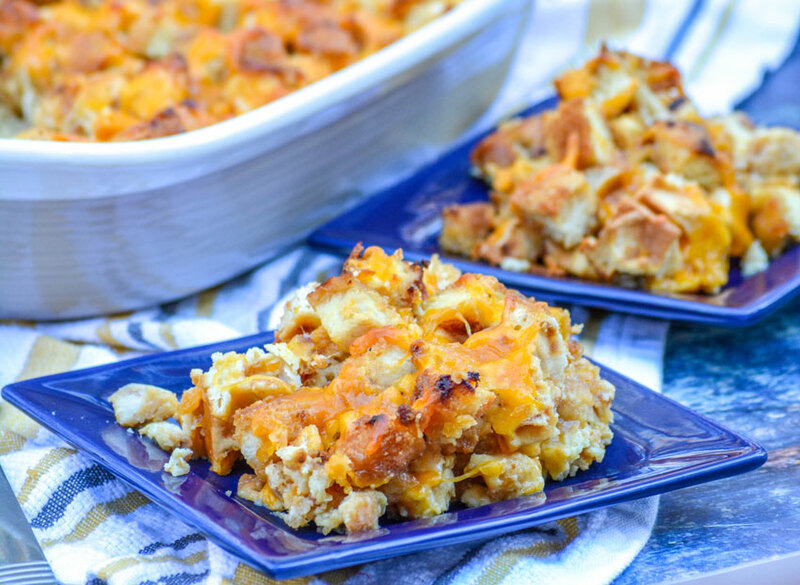 It’s fun food, the whole family will enjoy- and it’s perfect for practically any meal, for potlucks, brunches, even holidays. 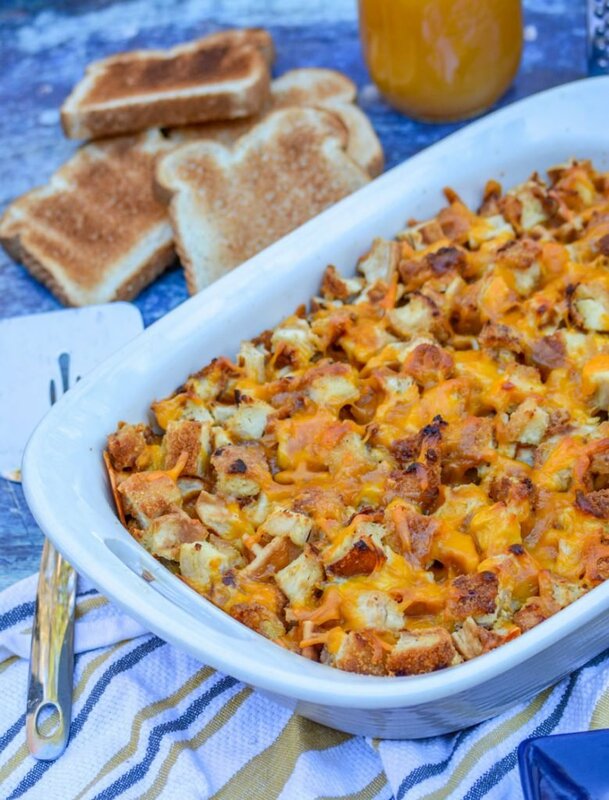 Perfect for breakfast or dinner, this cheesy casserole features chunks of fried chicken and pieces of fluffy Belgian waffles drizzled with sweet honey and bound together with creamy eggs. Spray a casserole dish with non stick cooking spray. Layer 1/2 the chicken, then 1/2 the waffles, and half the cheese. Repeat. In a large mixing bowl, whisk together the eggs, half & half, maple syrup, and salt & pepper, to taste- until the mixture's smooth and evenly incorporated. Slowly pour the mixture evenly out over the casserole. Cover the mixture tightly with syran wrap and refrigerate for an hour. 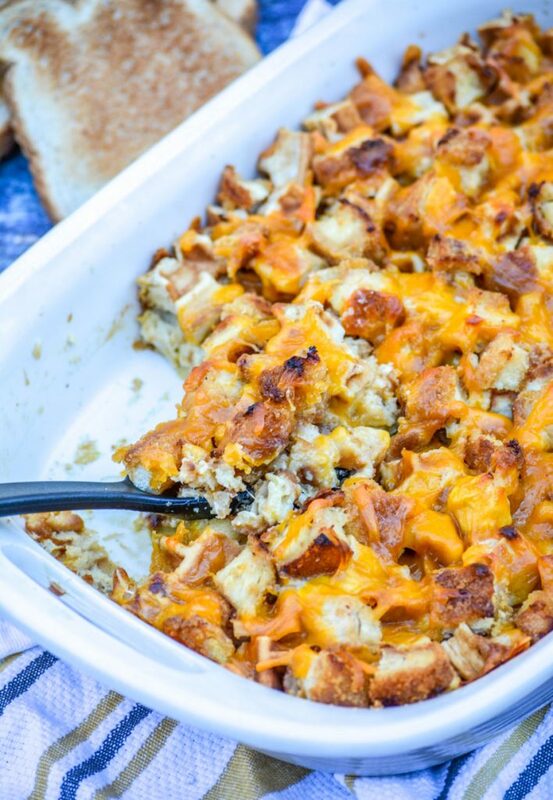 Bake the casserole for 45 minutes at 325 degrees. Remove from the oven, and let it rest for 5 minutes before slicing and serving. Serve drizzled with maple syrup (optional). Well this looks like the perfect dish for the horrid weather you are experiencing in your neck of the woods! Perfect comfort food! Thanks so much for bringing it over to FF this week. I am sure that it will bring others some comfort this week too as they try to make it through the cold spell!